“Let’s see if he can figure out which way to go”, chuckled Steve behind me, as I emerged from the stairwell and tried to walk into a cupboard. He was addressing his friend and fellow Sherlockian Ray but he was talking about my efforts to find my way around the labyrinthine basement of Otto Penzler’s Mysterious Bookshop, in New York. 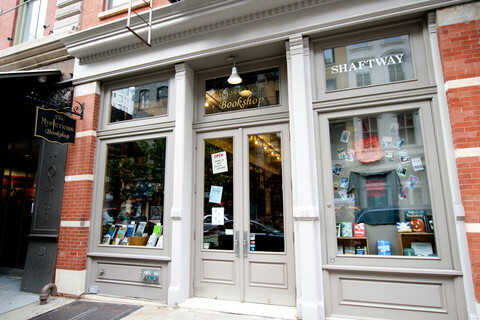 Nestled among the historic industrial buildings and modern lofts of Tribeca, on Warren Street, the Mysterious Bookshop claims to be “one of the oldest mystery specialist bookstores in America”. Every year Otto, a long-standing member of the Baker Street Irregulars, the world’s oldest and most famous Sherlockian fan society, puts on a special Sherlockian-only viewing of his wares as part of the BSI’s annual Weekend celebrating Holmes’s birthday. I actually hadn’t planned to visit the bookstore this year; there are only so many hours in the day and mine were already full of Sherlock-related things. Yet, after brunch with Ray (Betzner, Pennsylvanian and BSI member) and Steve (Rothman, fellow Pennsylvanian, BSI member and editor of the Baker Street Journal), I was happy to tag along and see what I might find. ‘Find’ is perhaps too strong a word to use in a place like the Mysterious Bookshop, where the books almost jump out at you. At the back of the store, one whole wall is dedicated to Sherlockian fan writing, fiction and criticism. I know this is true because within five minutes of walking into the shop Steve, Ray and Otto were each on ladders or scrabbling around on the lower shelves plucking off books which seemed, to them, pertinent to my PhD research. In no time my arms were full of relevant reading. Either I did a good job of explaining myself or these men were very intuitive. (Or, most likely, Otto keeps a very well stocked shop). After I had discreetly placed most of the books back (for lack of money, not interest!) I followed Steve’s suggestion that we head down to the basement. 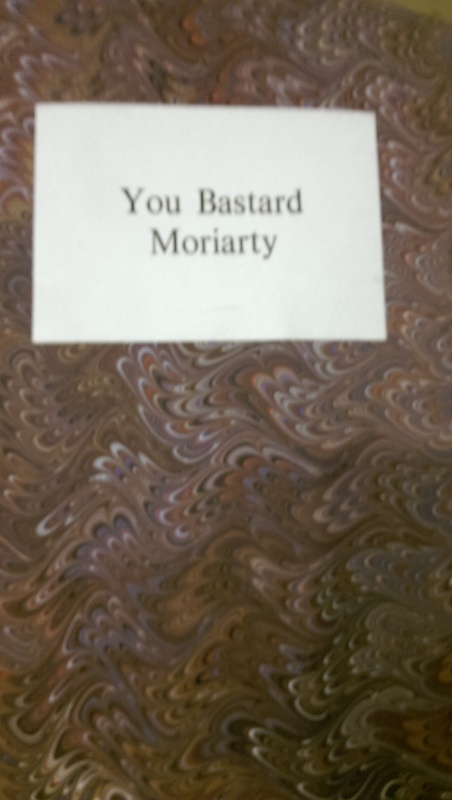 After my detour into the broom cupboard, I got on the right path and found myself in a room filled with rare and interesting Holmes-related books. Most lined the wall-mounted bookcases while still more filled the tables in the middle of the room. It was a Christmas card from 1964; unwritten and unsent. The card was printed, so I discovered from the inside page, by Edward Chichester, 6th Marquis of Donegal, long-time member of the Sherlock Holmes Society of London and former editor of the Sherlock Holmes Journal. This was interesting in itself, for why would Don (as he liked to be called) keep only one card from a presumably larger run? Yet, if it came to the bookshop via a recipient, wouldn’t it have been written and signed? In any case, I let these questions sit and turned instead to what had caught my eye in the first place. On the front of the card was a reprint of Julian Wolff’s Sherlockian Map of England, with colour added onto what I later found out was a black and white original. (fig. 3) The map depicted sites from Doyle’s Sherlock Holmes stories, the fifty-six shorts and four novels that make up what Sherlockians, that is, fans term ‘the Canon’. Also marked, alongside country and county lines, were locations that even non-Sherlockian fans can agree to, such as Coventry, Exeter and Frinton (the latter a seaside town in Essex where I spent many a happy summer’s day as a child). What intrigued me about this map is the relationship between literature and geography that it suggested. By including fictional, Sherlockian settings such as King’s Pyland, purportedly in Devon alongside real-world locations with no Sherlock Holmes connections, such as Waterbeach (which I can attest is a short bike ride along the river from Cambridge; though be careful as the path gets muddy in the winter), Wolff and by extension Donegal were making a particular claim about the value of literary locations in relation to geographical imaginations. Wolff appears to be saying not only that these fictional locations might exist but that they might as well exist – and, in fact, to the Sherlockian fan they are as real as any non-fictional place as yet unvisited. However, Wolff’s apparent claim about the geographical truth value of fictional, Sherlockian places is more complicated than it first seems. The map used by Donegal on his 1963 Christmas Card was copied from a map drawn by Wolff to accompany a book called Baker Street and Beyond. Written by leading Sherlockian Edgar W. Smith, with forewords by Christopher Morley and Vincent Starrett, this 1940 gazetteer was the first attempt by fans to record the various locations that feature in Doyle’s Sherlock Holmes stories. In this context, Wolff’s simple line-drawn maps, plotting bald locations with rough geographical accuracy serve to liven up what is in essence a rather long alphabetical listing. Yet the maps actually do more than provide diverting illustrations; they form a link between the fictional world of Sherlock Holmes and real-world geographies. Smith’s gazetteer deliberately draws no geographical distinctions between real-world places represented in the stories, fictionalised versions of probable real-world locations or locations wholly invented by Doyle. This is because his list is related entirely to Doyle’s stories: Smith sought not to tie Doylean locations to their likely real-world counterparts but rather simply to list those locations as they appear in the text. Thus what results is a motley assortment of real-world geographical statements combined with descriptions of events in the fictional world of Sherlock Holmes. For example, under ‘Kensington’ we read: “A metropolitan borough: somewhere in which lay the ostensible destination of Mr Melas – The Greek Interpreter”. Smith’s gazetteer on its own doesn’t really engage with issues of geographical fact or fiction. This seems counterintuitive for two reasons. First, the sentence above clearly posits fictional actions in a real place – the London borough of Kensington. Secondly, Smith sets out his philosophy on the question of fact and fiction in Sherlockian geography in his introduction, justifying his jumbling of real-world and fictional places into one alphabetised list. However, it is apparent because Smith’s gazetteer doesn’t actually step outside of the bounds of Doyle’s text. So while Kensington is indeed a metropolitan borough in London (or was, at least, before the 1980s), it is also a metropolitan borough in the London of the fictional world of Sherlock Holmes. Figure 3 Wolff’s Sherlockian Map of England, from his 1952 Sherlockian Atlas. Only 100 copies of this pamphlet were made. 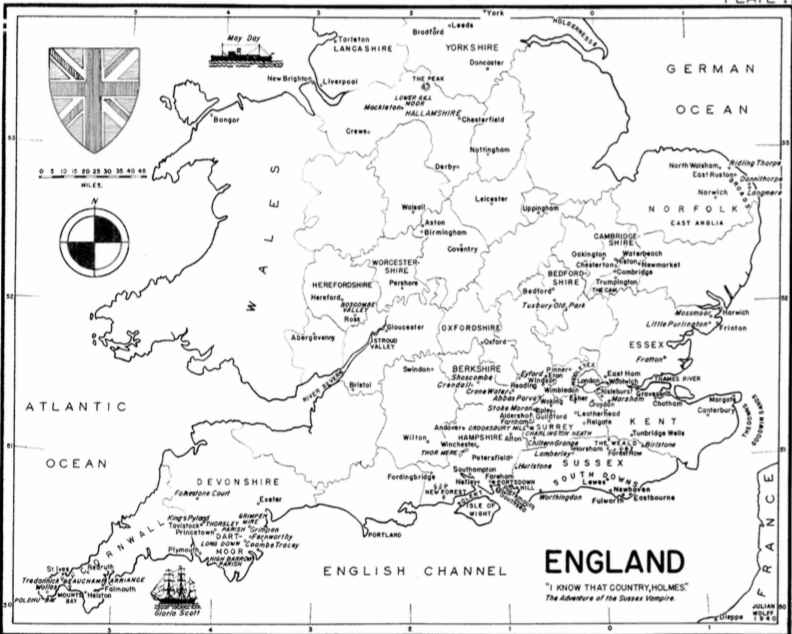 By presenting Sherlockian and non-Sherlockian place names on the same representation of a recognisably real-world England, Wolff’s map begins to bridge the divide between Smith’s exploration of the fictional world of Sherlock Holmes, including the activities which occur in each location, like Mr. Melas travelling to his destination in Kensington and the world outside of the text. In this way, Wolff’s map, read in the context of Smith gazetteer, presented not only an interesting new way to view the geography of the Sherlock Holmes stories: it presents an argument through geography for the historical occurrence of the events of the Sherlock Holmes stories, as quoted in Smith’s gazetteer. Published as they were in the 1940s, at the height of Sherlockian’s first golden age in America, by some of the world’s leading Sherlockians, it is fair to say that Smith’s gazetteer and Wolff’s maps had a profound influence on they ways in which future Sherlockians imagined the world of Sherlock Holmes and its relationship to real-world geographies and readers’ geographical imaginations. Indeed, Donegal’s Christmas card, printed twenty years after Wolff’s map first appeared in print and more than a decade after his Sherlockian Atlas is testament to that influence. 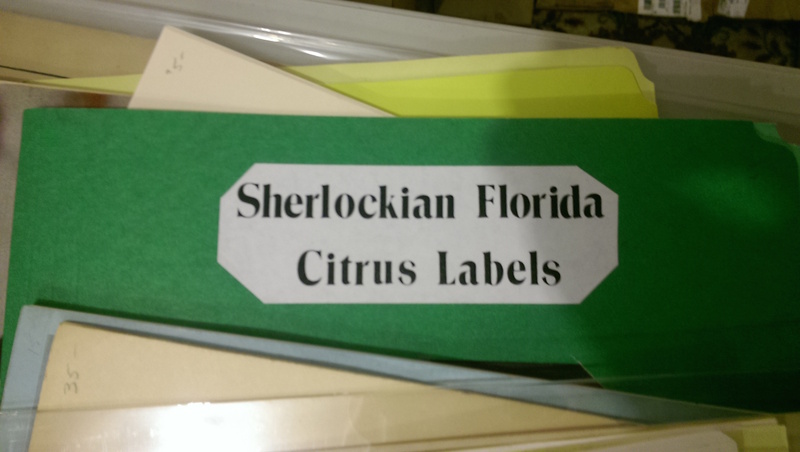 So, really what I’m saying is, if you scratch a Sherlockian you’ll probably find a geographer in there somewhere, with some interesting things to say on the relation between real-world and fictional places. It’s probably polite to explain why you’re scratching them first. This entry was posted on March 4, 2015 by Dave McLaughlin and tagged Arthur Conan Doyle, Britain, detective fiction, Geography, Maps, Sherlock Holmes.